Did Netflix stay on top in the streaming game, or did a new challenger emerge to dethrone the champion? Where was the best place to binge in 2018--or, if you're more into curation, which streaming platform or service had the best selection this year? Where did you binge the most this year? Did Netflix stay on top in the streaming game, or did a new challenger emerge to dethrone the champion? Where was the best place to binge in 2018--or, if you're more into curation, which streaming platform or service had the best selection this year? The answers might surprise you, as the streaming landscape has shifted and changed since last time we took a hard look at it. Yes, Netflix has absolutely dominated in the category of original content--largely by simply making as many exclusive movies and shows as it can, and hoping some of them turn out great (which they did). But did you manage to take advantage of Filmstruck while it was around? If not, you missed out on streaming some of the greatest films ever made, not to mention the exclusive special features that often accompanied them. Or what if horror is more your flavor? Sure, Netflix had some great original horror movies and shows this year, but the classics were located elsewhere, on a platform that finally hit its stride in 2018. If you were looking for more recent TV, Hulu was your best bet, whereas wrestling fans did themselves a disservice if they still managed to avoid subscribing to WWE Network this year. And there was even one brand new service that, despite starting weak, turned into an essential by the end of the year thanks to one show. Where did you binge the most in 2018? What services did we miss, and what did we get wrong? 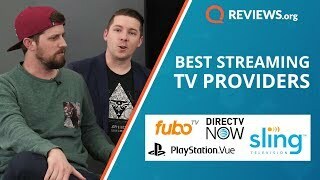 Or do you agree that these were the best for streaming this year? Let us know in the comments down below, then check out the 30 best Netflix exclusives of 2018 as well. During the summer, DC announced its own streaming service to compete with Netflix, Hulu, Shudder, and the slew of others. Called DC Universe, the new app allows users to watch DC movies and TV series, browse comic books, and talk to other users in a community section. However, even when we got our hands on the early beta testing for it, DC Universe was just ok. The service was hitting the same problems any would face in its first year; most importantly, lack of content. But the early months for a new streaming service can be rough, and it's all about what it does next to evolve. Much like Hulu, Amazon Prime Video spent a lot of 2018 continuing to work on its back catalogue of movies and TV shows to pick up where Netflix is seemingly dropping the ball. Aside from Prime's original series, of which there are a few really worth checking out, Prime's ample selection of movies ranges from contemporary blockbusters to straight-to-video atrocities that are immensely fun to watch. You can watch legitimately brilliant movies like The Big Sick or What We Do In Shadows, or you can sit down for popcorn flick Hobgoblins, which is a ripoff of Critters, which is actually a ripoff of Gremlins--from space. While Netflix has plenty of new, independent, and studio horror, it doesn’t exactly dip into the genre’s rich and varied past. Thankfully fright fans have AMC’s Shudder, a streaming services aimed directly at them. It launched in 2015, but 2018 was the year that it really came into its own. The site cleverly divides its catalogue into "collections" with titles like "Bad Genes & Killer Kids," "Psychos and Madmen," and "Zombie Jamboree." It’s a carefully-curated selection too--Shudder boss Sam Zimmerman has made a point of stating that he wants to make Shudder’s catalogue representative of the huge diversity and quality in the genre, and not just fill it up with rubbish. If you’ve never used Filmstruck before, then we have bad news for you--the service no longer exists. Launched in 2016 as a joint venture between the Time Warner-owned Turner Movies and classic/foreign language/arthouse blu-ray specialists Criterion, Filmstruck was a movie buff’s dream streaming service--a deep and rich collection of incredible movies from across the decades that covered almost every base. From French new wave and Italian neo-realist to film noir and screwball comedy via American indie and Japanese samurai movies, there really was something for everyone. In addition, many of the amazing extras from Criterion’s releases could be found on there, alongside interviews and essays created just for the service. Sadly, AT&T’s purchase of Time Warner earlier this year meant that in October it was announced that Filmstruck was to close within a few weeks, its new owners clearly uninterested in what they described as a "niche" service. Hulu stayed the course in 2018, continuing to offer day-after viewing for many television series airing on network and cable TV. This is increasingly important with some networks pulling new episodes from the service, the most notable being FX only allowing Hulu to air past seasons as the cable channel pushes out its FX Plus service. Staying relevant this year as a streaming service was tough, but Hulu continued to offer TV series, movies, and original content. The WWE Network is a must-have for any professional wrestling fan. For the price of $9.99 per month--it's a minor miracle the price has not changed since the Network's February 2014 launch--users can stream every new WWE pay-per-view, live. They can watch every past WWE PPV as well; if you want to set up a massive binge marathon, starting with Wrestlemania I and ending with Wrestlemania 34, you can do that. If you want to watch every single Raw, in order, from 2013, you can do that too. Newer television episodes are uploaded as well, on a slight delay. Netflix is such a powerful force in modern entertainment that it's easy to take it for granted. In many households it has replaced regular TV as the go-to destination for an evening's entertainment, and it continues to influence and disrupt more traditional outlets for films and TV. While Netflix does still stream shows and movies made by other studios and companies, it is of course increasingly interested in creating its own content, and 2018 saw it flex its muscles in that area more than ever before. On the TV side, its biggest dramas and comedies continued to pull in major talent, and many of the year's best shows were Netflix Originals. It's impossible to think about the year's TV without talking about The Haunting Of Hill House, GLOW, The Chilling Adventures of Sabrina, Maniac, or Daredevil. When it comes to movies, 2018 saw the company attract some big-name filmmakers, with such acclaimed directors as the Coen brothers (The Ballad of Buster Scruggs), Alfonso Cuaron (Roma), Jeremy Saulnier (Hold the Dark), David Mackenzie (Outlaw King), and Paul Greengrass (22 July) choosing to make their latest movies for the service. And that's not mentioning the wealth of documentaries, reality shows, and family content that hit the service on a weekly basis. While it could be argued that the company's rush to fill its arsenal means that the quality can sometimes suffer, the only real problem is having simply too much to watch.